At Forevermore, a sleepaway camp in the Pacific Northwest, campers are promised adventures in the woods, songs by the fire, and lifelong friends. Bursting with excitement and nervous energy, five girls set off on an overnight kayaking trip to a nearby island. But before the night is over, they find themselves stranded, with no adults to help them survive or guide them home. 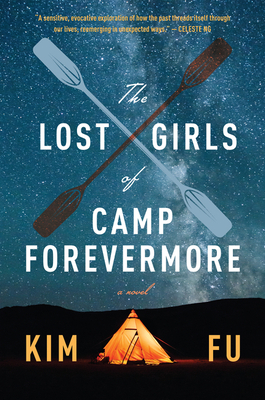 The Lost Girls of Camp Forevermore follows Nita, Andee, Isabel, Dina, and Siobhan beyond this fateful trip, showing us the lives of the haunted and complex women these girls become. From award-winning novelist Kim Fu comes a stunning portrait of girlhood, the nuances of survival, and the pasts we can’t escape. KIM FU is the author of the novel For Today I Am a Boy, which won the Edmund White Award and was a finalist for the PEN/Hemingway Award and the Lambda Literary Award, and was a New York Times Book Review Editors’ Choice. Fu is also the author of the poetry collection How Festive the Ambulance. She lives in Seattle, Washington.